Corazon is very pretty. Love the color. I have one finished yarn this week. I call it "Sherwood". There are actually 2 skeins of this, for a total of 6 oz and around 300 yards. It's romney, and although it softened up a bit after washing, it's still a bit scratchy. I'd probably use it for a felted project. 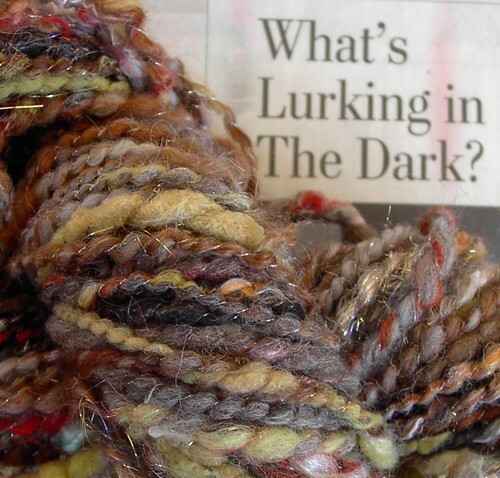 This is from the first fiber I ever got, a gift from the friend who sold me the spinning wheel. It's about half of the 8 oz of Merino Superwash from Crown Mountain Farms in the Heat Wave colorway, which appears to be called "Light My Fire" now. 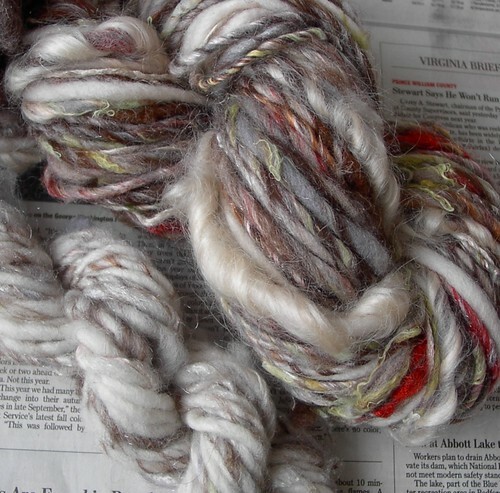 I am trying very hard to turn this into a 2-ply, sock weight yarn. I think it is going pretty well so far, but still have half of the fiber left to spin. Great yarns you two! My wheel has been neglected for quite a while now, I've been spending a lot more time knitting, since it's more portable for me and I've had to spend a lot of time on the road. Good to know. 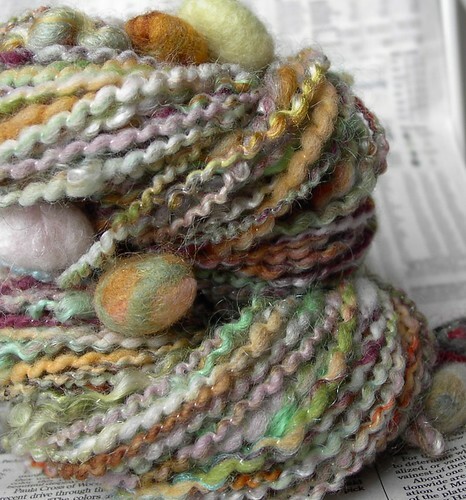 I hadn't bought the fiber myself, when I bought the wheel, I got the fiber as a birthday present, but it was so pretty, I didn't feel like my spinning could do it justice, so I put off working with it. It spins up so nicely though. I definitely want to order more fiber from them; I'm in love with the Atlantis colorway. Corazon is beautiful!! It looks so plush and vibrant. 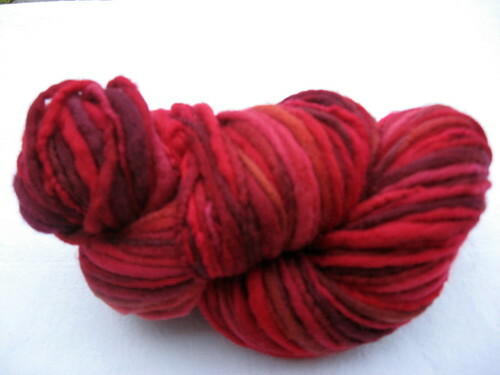 And the crown mountain farms colorway looks lovely too. I've been spinning so much lately, but I think I'm going to have to take a few days off because my apartment really needs to be cleaned. 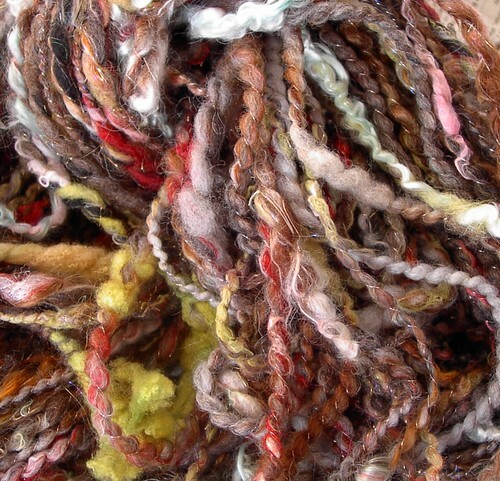 There are little tufts and bits of wool everywhere - kind of like a rainbow sheep exploded in here. Cloudwatching - omg. I kind of want to keep this one around just to snuggle. It can be my pet. It's so plush and squishy-soft! There are also a ton of slubby tufts of angora bunny fluff and kid mohair. 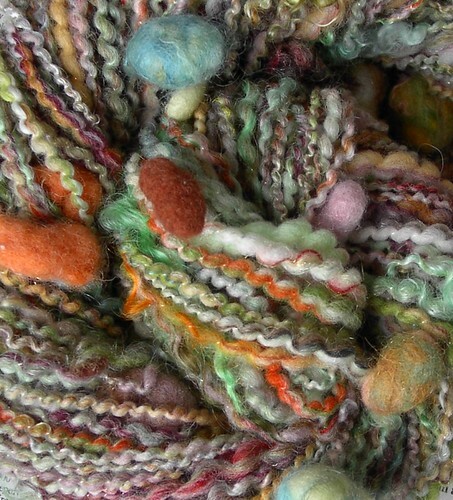 Candy Mountain - spun from a batt carded from random multicolored bits of merino-cross wool, plied with invisible thread strung with 30 felty baubles. First Snowfall - We had the first snowfall of the year here last Tuesday, and this yarn was inspired by my morning walk to the post office that day - the dark contrast of the street & tree branches against the snowy whiteness, the red headlights glimmering in the distance, the misty clouds of breath, the grey skies, the last stubborn bits of green grass & weeds poking up through the blanket of snow, and the sense of stillness and wonder everywhere. 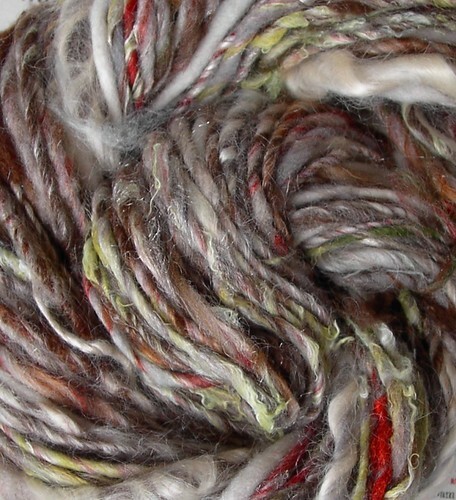 I blended the fiber for this on my drum carder. I started with white and natural (undyed) brown falkland wool and added in gray falkland wool, natural chocolate brown wool and pale grey-brown wool from a small local farm, black mill end wool, shiny silvery-white tencel (a fiber made from wood pulp)/linen blend, white and red sparkle, red and brown raw rambouillet locks from a small local farm, white and brown mohair, white angora bunny fluff, shiny white bamboo, and green ecospun (a fiber made from recycled plastic bottles). I spun in big coccoons of fuzzy white mohair as I went. 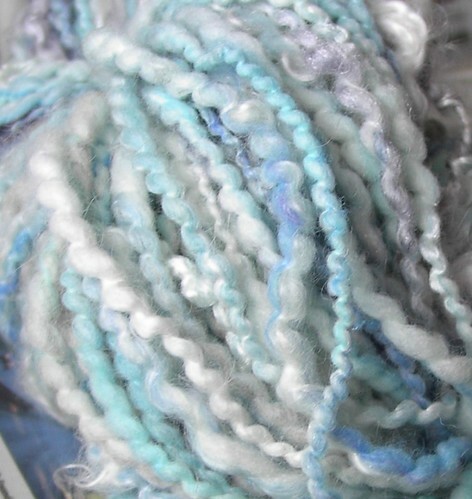 I also spun a little mini skein to compliment this yarn - it's spun from white falkland wool blended with the scraps from the first skein. Sorry I got so talky! I actually spun more than this, but I'm too lazy to post it all. You can see the rest by clicking on any of my pictures to go to my flickr account. I can't wait to see everyone else's yarns! here is my first round. i got the ball winder last night...and had a little fun. *cough* maybe too much fun. i'm not exactly sure what type of sheepie the to wools are, i got them in Bodega, CA (you know where curch from 'the birds' is located) they were having some Christmas fair the day after thanksgiving and i grabbed a paper shopping bag full of the brown stuff(batting, all sorts of fiber length.. not the best to spin.. but very cheap and perfect for a beginner run) and the white roving.. for $20.i've barely made a dent in each. *squee* plying is a crazy amount of fun. but i think i'm going to have to get another flyer so i can do a bit more chunky stuff..
and for added fun.. i made plastic yarn.. actually i was just going ot do the loop method and then crochet it.. but after a few chains.. i decided to spin it.. why not eh? 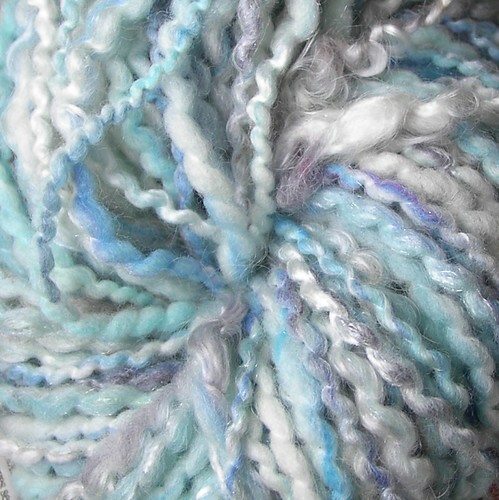 OMG Cloudwatching is divine yummy yarn to covet! I don't think I'd part with that either. Man that is beautiful I also like the All that remains yarn. I have a clean trash can in my craft room I use to collect remnants and stuff I clean off the carder that I hope to one day make into neat stuff like that. The crown mountain farms fiber is hotness too! Super job gang!! All of it fibery goodness! inle- I really like heatwave, it's so pretty on the bobbin. What are you going to make with it?